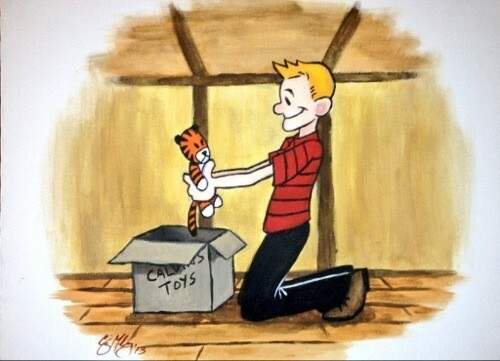 WARNING: This portrait of a grown-up Calvin (of Bill Watterson's immortal "Calvin and Hobbes") by artist and comedian Craig Mahoney may cause tears to uncontrollably fly out of your face. No judgments. It happened to us, too. The painting, 24"x18" acrylic on canvas, is part of Mahoney's solo show Portraits of Awesomeness: The Art of a Fanboy, opening June 7 at Boca Grande Cantina Mexicana in Jersey City, NJ.